Yosef and Yuya: Does Archaeological Evidence Prove the Biblical Narrative of Joseph? In 1905, British Egyptologist James Quibell discovered a new tomb in the famed Valley of the Kings, where many of Egypt’s greatest mummified pharaohs were found. In this tomb were the bodies of two highly-preserved mummies, one male and one female: Yuya and Tjuyu. Scholars were astounded at the grand way in which Yuya was described: “the king’s lieutenant”, “master of the horse”, “superintendent of cattle”, and even, strangely, “father of the god”. Most amazingly, though, was the fact that Yuya was buried in the Valley of the Kings, despite never having been a pharaoh! Yuya was a unique and puzzling archaeological find. Who was he? Rashi explains that the term Avrekh is a contraction of av, “father”, and rikha, “king”, in other words, Joseph was called aba malka, “father of the king”, or “father of the pharaoh”. We are then told how Joseph stockpiled food during the seven years of plenty, carefully mapping out a strategy to survive the coming years of famine. Not only did he plan for Egypt’s survival, but he ensured that Egypt would have enough to sell to all of the neighbouring nations and kingdoms that would also be affected by the great famine. Through this, he was able to make Egypt the wealthiest empire on the planet, turning what should have been seven years of hardship into seven years of immense prosperity. No doubt, such a person would certainly be immortalized in Egypt’s history as one of its greatest leaders. In fact, the archaeological record appears to suggest that he may have been after all. Historians have uncovered a great deal of information about Yuya since the discovery of his tomb in 1905. He lived during the Eighteenth Dynasty of Egypt (1543-1292 BCE), and was an influential minister in the Pharaoh’s court. Strangely, his name is not of Egyptian origin, nor is his appearance. Many scholars believe he must have been a foreigner. He is described as being in charge of the horses and chariots, as well as the cattle. He is also titled “father of the god”, or more accurately, “father of the pharaoh” (since the pharaohs considered themselves gods). It isn’t difficult to see that Yuya is described in terms almost identical to the way that Joseph is described in the Torah. Egyptian journalist and author Ahmed Osman published a controversial book in 1987 about Yuya’s identification with Joseph, titled Stranger in the Valley of the Kings. 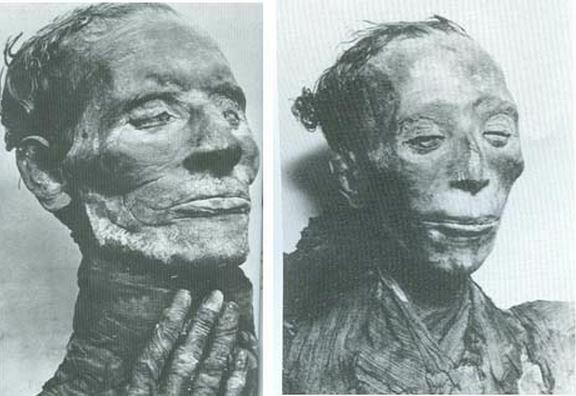 He pointed out how Yuya’s mummy has Semitic features, evidence of a beard worn in the Hebrew style, and is the only mummy found to have its hands under its chin as opposed to across its chest. Moreover, the description of “father of the god/pharaoh” parallels Joseph’s description as Avrekh. Could the two really be the same person? 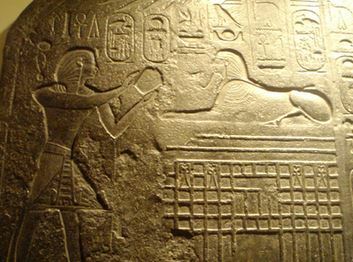 The historical record suggests that Yuya was the minister of the Pharaoh Thutmose IV, who reigned around 1400 BCE. This is not too far from the lifetime of Joseph. More amazingly, archaeologists have found a stele (an inscribed stone) commissioned by Thutmose IV that describes one of his dreams! Like Joseph’s pharaoh in the Torah, Yuya’s pharaoh Thutmose also derived great significance from his dreams. It is further interesting to point out that Yuya was found entombed with his wife Tjuyu, who is known to have come from a royal family with priestly origins. Similarly, the Torah states that Joseph married the daughter of an Egyptian priest (Genesis 41:45). And what of Yuya being a mummy? The Torah states: “And Joseph died at the age of one hundred and ten years, and they embalmed him and placed him in a sarcophagus in Egypt.” (Genesis 50:26) Joseph, too, was mummified! Having said all that, the Torah also states that Joseph’s tomb was later taken out during the Exodus from Egypt (Exodus 13:19), and eventually brought to rest in Israel. This would make it very difficult for his mummy to be found in the Valley of the Kings. On top of this, historians have presented a number of other issues with the identification of Yuya with Joseph. So, perhaps Yuya is not Joseph after all. Whatever the case may be, the amazing archaeological find of Yuya does give us proof that a foreigner could rise up through the highest ranks of Egyptian royalty, and even become “father to the pharaoh”. It gives us proof that the Torah’s account is quite accurate in its details, and in its terminology. And it certainly makes a compelling case for historical evidence of the Biblical narrative of Joseph. There are two more points that make the connection between Yuya and Joseph all the more fascinating. Historians see the root of the name “Yuya” as yw, which means “reed-leaf” in Ancient Egyptian. Meanwhile, Joseph’s name is יוסף, sharing a root with סוף, which also means “reeds” in Hebrew! The presence of “Ya”, a common appendage in Hebrew names to denote God’s name, makes it even more interesting. Finally, the historical record shows that Yuya’s daughter married the pharaoh. They had a son, who became the pharaoh Akhenaten. Akhenaten was Yuya’s grandson. And he went down in history for doing one major thing for Egypt: destroying all of its idolatry to make the nation monotheistic. Unfortunately, his attempt to turn Egyptian society and religion monotheistic ultimately failed, and the kingdom reverted to its idolatry. But it wasn’t long after that the Jewish people left Egypt, beginning the spread of monotheism to the entire world. This entry was posted in Archaeology & History, Mysteries & Origins and tagged Akhenaten, Archaeology, Avrekh, Dreams, Egypt, Exodus, History, Joseph, Monotheism, Mummy, Pharaoh, Semitic, Stele, Tjuyu, Valley of the Kings, Yuya on December 18, 2014 by Efraim Palvanov.